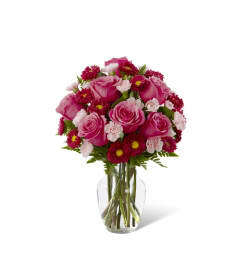 FTD® proudly presents the Giving Thanks™ Bouquet by Better Homes and Gardens®. 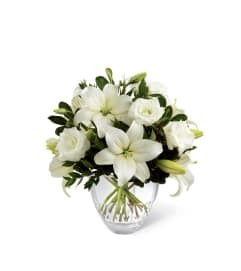 Exuding a superior warmth and sophistication, this gorgeous flower bouquet will be just the gift to send to become a part of your special recipient's fall celebrations! 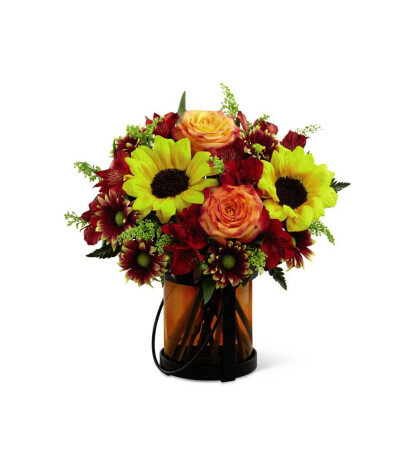 Stunning sunflowers are bold and beautiful when combined with bi-colored orange roses, red Peruvian lilies, yellow solidago, burgundy traditional daises and lush greens, perfectly brought together to create an unforgettable flower bouquet. Presented in a designer lantern inspired orange glass vase that can double as a candle holder after the original gift of flowers fades, this flower arrangement is a wonderful way to add to the beauty of their Thanksgiving celebration, as well as convey your thanks, gratitude or congratulations wishes.